The Australian new car market finished at just below 1.2m in 2016 and 2017 and the early signs are that the market will deliver a similar performance in 2018. The market has finally seen its last car maker Toyota shut up shop as a domestic car producer, with production costs deemed as too high when compared with imports from Japan and Korea that are now dominating the sales charts. That compares to a few years ago when Ford and Holden captured 25-30% of the home market sales. However, Toyota topped the charts in 2017 with its Hilux pick-up sales growing by 11.3%, with the Ford Ranger seeing 15.6% annual growth to take second place. Utility vehicle sales continue to grow as sectors like mining swallow up hundreds of commercial vehicles as has the construction sector, which has been buoyed by a rise in public investment. Sales are already up by over 20% in 2018. The success of light commercial vehicle sales is usually an indication of the economic prosperity of a country and Australia is living proof, having continually delivered between 2-3% growth each year. Like so many countries, SUVs are growing in popularity with the Hyundai Tuscon making the top 10 best sellers list, while Toyota remains the country’s favourite car maker. Personal leases have also grown in popularity over the past 12-24 months with consumers looking to switch from owning a car to the flexibility of leasing a car. Currently these account for up to 90,000 new car sales each year with Toyota Finance one of the biggest players. National leasing companies are offering competitive lease rates on new cars and then, when the consumer has equity in the car, calling them with an offer to swap them into another new car. Lease companies are also using Autorola to sell ex-lease cars upstream, whereby three to six months before the end of the contract the car is inspected and pre-sold to a buyer. Pre-selling the ex-lease car is proving an efficient disposal method for the leasing industry while the used market is extremely buoyant. Used cars are sold within days of being de-fleeted, while the customer gets to drive away in a new car which is keeping the market stimulated. Another strong source of used cars into the market is via the fleet sector. Offering a company car is part of the recruitment package as a bonus, especially as the competition to employ talent across the country is high. Typically, fleets are keeping cars for between three and four years, and up to 140,000km and these are offering a different type of used stock proposition to dealer part exchanges and ex-personal lease trade-ins. 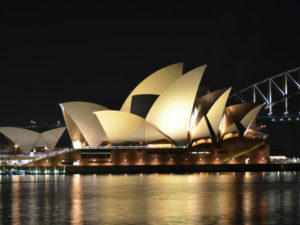 Tourism continues to grow in Australia and with it the rental market, particularly around Sydney and Melbourne. Nine million visitors were welcomed in the year ending March 2018, an increase of 7.7% and sufficient growth to see all the major rental companies extend their hire fleets. Hertz remains the number one rental company, with the majority of cars now being purchased on risk as opposed to manufacturer buy-backs. The larger hire companies tend to keep cars for 18 months while the smaller independents usually replace their cars every 24 months. Ex-rental cars provide valuable used stock into the market as they fall between dealer part exchanges and ex-fleet cars. A continued growth area for Autorola’s online remarketing proposition is the salvage market where cars are inspected, photographed and offered for sale in situ. On average Autorola runs two salvage auctions a day online and between 400-500 salvage cars online each month, a figure which continues to grow. Selling the vehicle online is an efficient route to market due to the physical size of the country. The vehicle is marketed online but does not move until it has been purchased by the buyer thus reducing the need for insurance companies incurring expensive transport costs. Offering salvage vehicles for sale online to a wide range of buyers also ensures the insurance company gets the best price. The Autorola proposition has transformed the market as previously salvage stock would just be offered to local trade buyers, or it would be taken to a regional storage yard incurring huge transport costs to be auctioned. Online remarketing not only speeds up the sale but also ensures it remains a highly cost-effective process. Overall the Australian economy is looking forward to more years of stability, but with the advent of the growth in personal leases and the end of domestic car production the automotive sector continues to reinvent itself. Despite dipping slightly in March on concerns over rising global protectionism, business confidence and conditions remain rosy in Australia, boding well for non-mining business investment. In addition, consumer confidence remained positive in April. However, the labour market has cooled in recent months, and although retail sales surprised on the upside in February, early signs suggest momentum was not maintained in March amid weak wage growth and consumers’ high debt. This comes after economic growth slowed in Q4 on a negative contribution from the external sector and lower construction investment, as large mining projects neared completion. In annual terms, retail sales grew 4.4% in March, up from 3.0% in February. As a result, growth in annual average retail sales rose to 2.8% in March from 2.6% in February. In late March, the Government announced it was delaying its flagship corporate tax bill due to a lack of support in the Senate, where the Liberal-National coalition lacks a parliamentary majority. Promoted by the administration as vital to attracting investment, there are concerns over the potential impact on the budget deficit. The economy should be buoyed this year by stronger LNG exports as new projects come onstream. In addition, non-mining investment will likely increase at a robust pace, supported by loose monetary policy, population growth and dynamic global economic activity. However, meagre wage growth and high levels of household debt will continue weighing on the economy. FocusEconomics panelists expect GDP to expand 2.7% in 2018, unchanged from last month’s forecast, and 2.7% again in 2019. Nominal retail sales growth in March was flat over the previous month in seasonally-adjusted terms, down from February’s 0.6% increase and coming below market expectations of a 0.3% rise. Higher sales in food retailing offset contractions in department store sales, as well as in sales of household goods, and clothing, footwear and personal accessories. The business confidence index produced by the National Australia Bank (NAB) increased to 10 points in April from 8 points in March. The series thus moved further above its long-run average and the neutral zero-point threshold, indicating that Australian businesses are largely optimistic regarding economic conditions. Looking at the sector-by-sector picture, the construction, mining, and transport & utilities sectors grew more optimistic, while the manufacturing sector became slightly less optimistic. All sectors remain firmly in positive territory. Meanwhile, business conditions improved in April to an all-time high on the back of better trading conditions, profitability and employment. Forward orders, on the other hand, eased marginally but remained in positive territory, while the capacity utilisation rate edged up in April. Coupled with elevated profitability, this bodes well for non-mining business investment this year.